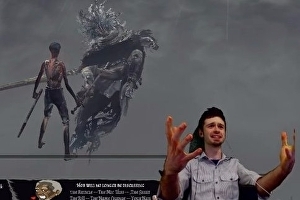 Dark Souls veteran and Twitch streamer made a name for himself earlier this year when he . Though the pro player was not the first to attain such a victory in Dark Souls 3 (a feat ) he was the first to make his way through From Software’s latest without taking damage and fighting every boss. Fans of the series will know that the most challenging boss fights in these games are often optional. Dark Souls 2’s Darklurker and Bloodborne’s Ebriatas were commonly cited as the most fiendish challenges in their respective games and Dark Souls 3’s hidden villain, The Nameless King, is widely considered the most arduous challenge in this sequel. The_Happy_Hob is known for making things extra hard on himself by deleting a profile and starting from scratch every time he takes a single hit. You can see the agony on his face at the 4:46:07 mark where he messes up in the home stretch after nearly two hours.